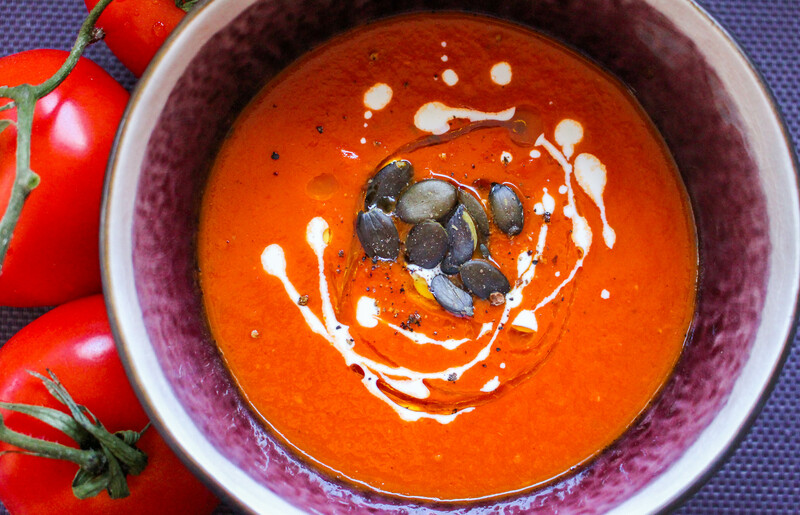 Use the best tinned tomatoes you can get your hands on for this soup. 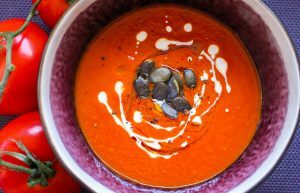 Higher quality tomatoes will give the soup a better flavour. Begin by pre-heating your oven to 180C. Place the fresh baby tomatoes whole in a dish with some salt and pepper and a glug of olive oil. Cook for around 30 minutes. This will intensify the flavour and sweetness of the tomatoes. In the meantime, take a pan and gently heat some olive oil along with the onion, a pinch of salt and the dry herbs and spices. Try to avoid caramelising the onion, the aim is to soften it to bring out its flavour. Add the tomato paste, tinned tomatoes and about 600ml cold water to the pan along with the vegetable stock cubes. Cook until your tomatoes are ready then add them to the soup including any liquor that may have seeped out of the tomatoes during the roasting process. Cook for another 20 minutes then using a stick blender, blitz the soup until you reach a velvety smooth consistency. Add a dash of red wine vinegar (about a tablespoon), some sugar or honey then check the seasoning, adding salt and pepper to the soup if necessary. Stir in a tablespoon of good quality olive oil to emulsify the soup then serve with a swirl of fresh dairy cream, coconut cream or top with some chopped basil leaves.